Florin 1946, Austrálie, George VI. 5 Cents 1966, Austrálie, Elizabeth II. 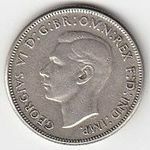 Shilling 1958, Fiji, Elizabeth II. 6 Pence 1953, Fiji, Elizabeth II. 6 Pence 1956, Fiji, Elizabeth II. 50 Cent 1975, Fiji, Elizabeth II. 10 Cent 1969, Fiji, Elizabeth II. 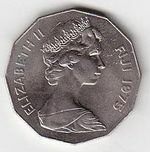 5 Cent 1969, Fiji, Elizabeth II. 2 Cent 1969, Fiji, Elizabeth II. 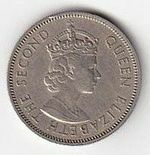 1 Cent 1969, Fiji, Elizabeth II. Florin 1950, Nový Zéland, George VI. Florin 1965, Nový Zéland, Elizabeth II. 6 Pence 1965, Nový Zéland, Elizabeth II. 3 Pence 1965, Nový Zéland, Elizabeth II. 50 Cents 1969, Nový Zéland, Elizabeth II. 20 Cents 1969, Nový Zéland, Elizabeth II. 1/2 Crown 1949, Nový Zéland, George VI. 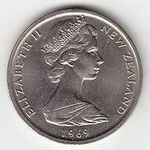 Penny 1964, Fiji, Elizabeth II.